The 2010 U.S. Capitol Christmas tree lighting ceremony on the west front lawn of the U.S. Capitol. Somewhere in the middle of a California forest stands a perfectly formed 65-foot white fir about to meet a glorious end as the U.S. Capitol's Christmas tree. Where exactly, though, is top secret. The tree chosen by the head of the Capitol grounds is somewhere in the Stanislaus National Forest in the central Sierra Nevada mountains. But Maria Benech, tree coordinator for the forest, said keeping the location secret is a matter of national security, to thwart both saboteurs and terrorists. Capitol grounds superintendent Ted Bechtol picked the tree from 30 candidates based on its conformation and density of foliage. On Nov. 5, foresters will fell the white fir, then take it on a 4,500-mile tour of America. 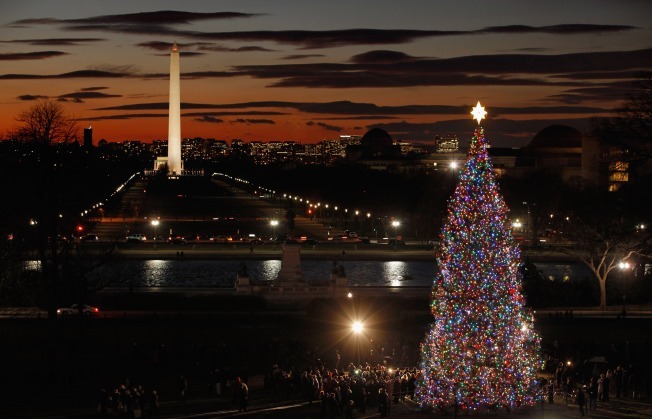 The speaker of the House will light the tree Dec. 6 in Washington, D.C. After Jan. 1, it will be ground up for mulching Capitol building gardens.